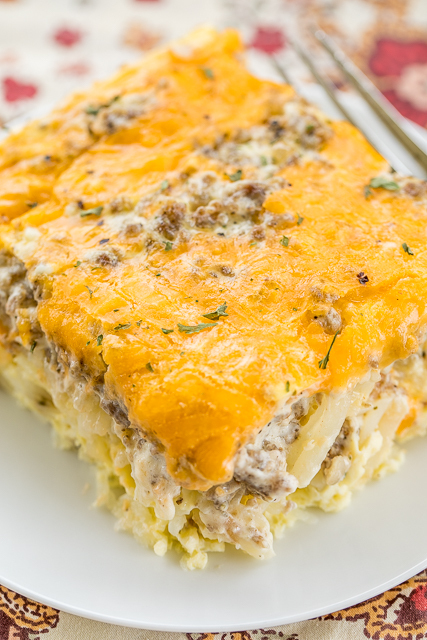 All of my favorite breakfast foods in one easy casserole! Can make ahead of time and refrigerate or freeze for later. Can split between two pans and bake one and freeze one for later. 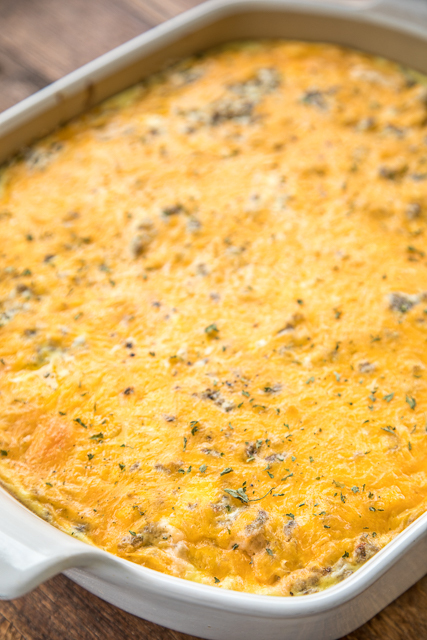 This breakfast casserole is great for breakfast, lunch, great for brunch, potlucks, tailgating and any upcoming holiday breakfasts! SO GOOD! I love the flavor combination of sausage and cream cheese. I am always looking for new ways to incorporate it into my favorite dishes. I tried it in a hashbrown breakfast casserole and the results were AMAZING! OMG! SO good!!!! You can make this casserole ahead of time and refrigerate or freeze for later. You can even split it between to pans and cook one now and save one for later. This casserole has all of my favorite breakfast foods. Frozen hashbrowns, sausage, cream cheese, eggs and cheddar cheese. I browed the hashbrowns in a large skillet prior to putting them in the casserole. I think it helped get the potatoes fully cooked and crispy. I used a roll of Tennessee Pride HOT breakfast sausage in this casserole. If you don't want the casserole to have a little kick, use all regular breakfast sausage instead. I also used regular cream cheese. I think using low-fat cream cheese would be fine, but I would stay away from the fat-free cream cheese in this dish. 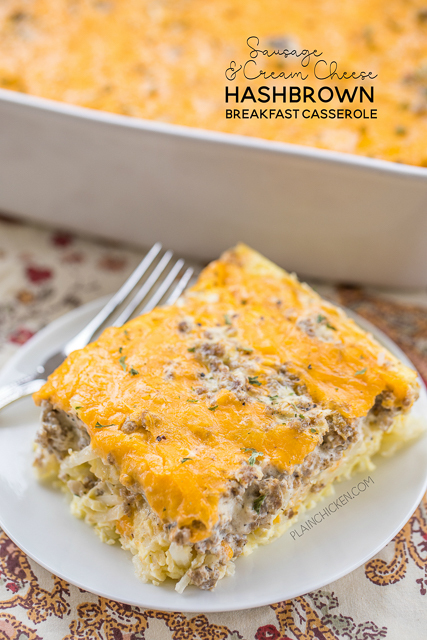 As I said, we absolutely LOVED this Sausage & Cream Cheese Hashbrown Breakfast Casserole! It would be great for brunch, potlucks, tailgating and any upcoming holiday breakfasts! Add hash browns to skillet and cook until lightly brown. Place hash browns in bottom of lightly greased 9x13-inch pan. Top with sausage/cream cheese mixture and shredded cheddar cheese. Oh my but this looks good. I've brought this to work several times and it always gets rave reviews. But it always has to cook at least an hour for me, usually longer. At 40 minutes it's still super runny. Can you clarify the layers for me? When I read the recipe is sounds like the eggs go on top of the cheese. In the picture, it looks like the cheese is on top. hash browns in bottom of lightly greased 9x13-inch pan. Top with sausage/cream cheese mixture and shredded cheddar cheese then top sausage & cheese with egg mixture. Can this be frozen with eggs and cream cheese in it? I froze leftovers and and it was great! Can it sit in the refrigerator over night covered? I was worried that the potatoes would turn? Or does frying them first keep that from happening? Can you refrigerate this dish covered overnight before cooking it or will the potatoes turn Brown? Would frying the hash Browns 1st keep that from happening? It should be fine. I’ve never had the potatoes turn brown. Enjoy!! Hi! If you were to freeze it beforehand, how much time do you let it thaw before putting in the oven (if any) and how much more cooking time should I add on? Thanks! If I were to freeze it how much thawing time (if any) and how much time added on in the oven? Thanks! I suggest thawing it overnight in the fridge. If it is still at light frozen, you will need to add some time. I’d start with 10-15 minutes. For those of you that have frozen this, do you bake it first? The recipe calls for two pounds of sausage but in the comments you wrote you used one sleeve of Tennessee pride (which one be one pound). Can you clarify how much sausage you used?! How far ahead can I make this and refrigerate? Would about 24 hours be okay? 24 hours would be just fine. Enjoy! I made this for dinner tonight (my hubby and I love breakfast for dinner), and it was a hit! He loved it! He said it was delicious, and one of the best breakfast meals he's ever had! Thank you so much for sharing your recipe! I really don’t know what to sub for hash browns in a hash brown casserole. I’m not sure this exact recipe could be made low carb. It would have to be totally reworked. I made this the other day for work and it was amazing. I only did half with sausage and cream cheese and the other half with colored bell peppers and cream cheese for the people who didn't eat sausage. I will definitely be making this again, but I may have to make two because the sausage and cream cheese went fast.